This chapter presents the empirical research design adopted to test our main hypothesis. We discuss how we constructed and our annual 0.5-degree grid cell-year sample of nondemocratic states and explain why this grid cell-year framework is appropriate for testing our main hypothesis. This is followed by a description of how we operationalized our dependent variable and one of the independent variables—namely, urban development per capita at the grid cell-year level. Finally, we conduct a large-N statistical analysis of the association between our urban development per capita measure and the likelihood of mass killing campaigns by 0.5-degree grid cell in nondemocratic regimes. Chenoweth, Erica, and Orion A. Lewis. 2013. Nonviolent and Violent Campaigns and Outcomes Dataset, v. 2.0. University of Denver, http://www.du.edu/korbel/sie/research/data_downloads.html. PITF. 2009. Political Instability Task Force Worldwide Atrocities Event Data Collection Codebook Version 1.0B2. http://eventdata.parusanalytics.com/data.dir/atrocities.html . Raman, B. 2003. The Karachi Attack: The Kashmir Link. Rediff: India Abroad. Last updated 26 February 2003. http://www.rediff.com/news/2003/feb/26raman.htm. Ross, Michael L. 2011. Oil and Gas Data, 1932–2011. http://hdl.handle.net/1902.1/20369UNF:5:dc22RlDasveOTAJvwIjBTA==V2. Timmer, Peter. 2004. Food Security in Indonesia: Current Challenges and the Long-Run Outlook. Working Papers 48, Center for Global Development. Available at SSRN: https://ssrn.com/abstract=1112807 or http://dx.doi.org/10.2139/ssrn.1112807. Tilly, Charles. 1978. Collective Violence in European Perspective. CRSO Working Paper No. 178. https://deepblue.lib.umich.edu/bitstream/handle/2027.42/50953/178.pdf. Ulfelder, Jay, and Benjamin Valentino. 2008. 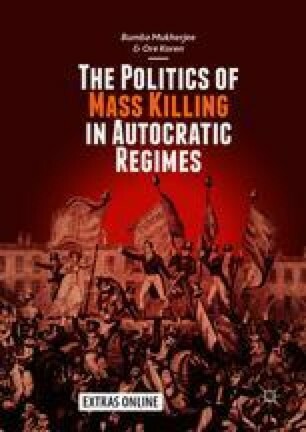 Assessing Risks of State-Sponsored Mass Killing. A Research Paper, the Political Instability Task Force (PITF) http://papers.ssrn.com/sol3/papers.cfm?abstract_id=1703426.